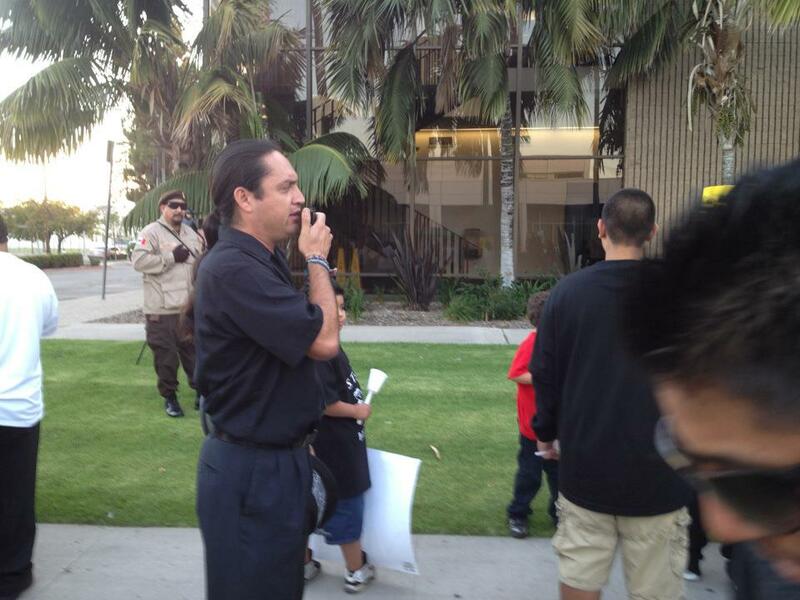 Justice for Robert Ramirez and all of the victims of Police Terror in Raza and Oppressed Communities! First and foremost, I offer my deepest condolences to Robert Ramirez’s familia. Your loss is felt within all of our corazones. One could only imagine how heart-wrenching it must have been bury your son, brother, sobrino, at such a young age. We are here to offer any type of support that we can in the unjust death of Robert at the hands of the Oxnard Police Department. I will talk a little more about that in bit. I wanted to introduce myself to everyone here. My name is Francisco ‘chavo’ Romero and I am a member of Union del Barrio which has been organizing for over 15 years here in Oxnard against police brutality and injustices against our gente. I am also here today as a member of the Colectivo Todo Poder al Pueblo, which has for the past 2 years has led some community actions and organizing in defense against the mirgra raids, detentions, deportations and police-migra collaboration, along with this issue, police brutality. Also, as some of you may know, Robert was my student nearly 12 years ago. He was in the first class that I ever taught in. I shared with you at the rosary that was held the night before we buried Robert, that he was an extremely intelligent young man. He was so advanced for his age in junior high and he always asked of me to give him more challenging work. He came in to class late often, and he only lived a block away! The entire class always loved when he came in and made his daily grand entrance. He always went out of his way to walk around the class and help other students with their work, he would usually help all of the girls in class especially. With a huge smile on his face he would come up to me throwing up his two thumbs up and winking at me, because he was able to get one of the girl’s number. In fact, this is how we all must remember him I am sure. He was always smiling it seemed, all day and night. He also walked with a flow, a rhythm, a strut. It was as if he had music playing in his head as he danced down the school hallways and down the block in the neighborhood. He was what one would call, a Cool Cat… suave with style. This is how I will always remember him for the rest of my life. In fact, I know he is smiling amongst and within us all here in this placita tonight. He is in our hearts and soul, que no, I am sure you feel what I am saying. I would like to ask everyone, to close their eyes and envision Robert with us here, or perhaps, take a trip into your mind and play out one of the most fun or happiest times you had with Robert. Maybe he was dancing with you at that backyard boogie, or eating dinner with you, or kicking back at the parque. Close your eyes please in this moment of silence. Thank you, and with our left fist symbolizing our commitment to struggle and fight to bring justice, we say Rest in Power, Robert Ramirez, Presente! Robert Ramirez, Presente! Now, this brings me to the political struggle that we are currently waging to bring those that are responsible for Robert’s death to justice. First, I want to let the Oxnard Police know, please do not come up to us with smiles and try to shake our hands like everything is fine and dandy. It is not… Seven of your officers, on the night of June 23rd, responded to a call where Robert needed medical attention, yet you came full force, surrounded him, brutalized him terribly thereby causing his death. At the order of police chief Jeri Williams, your assistant chief, Scott Whitney authored and pulled a movida, a dirty move, this past Tuesday by releasing the 911 audio of that night. We know clearly that this was done just days before this vigil tonight to cast a negative image of Robert. Rather than face up to the reality of the role the seven cops that arrived at the scene played in his wrongful death, you cops have opted to attempt to discredit and dishonor Robert and his familia! You want to paint Robert as just another young Mexican man that was caught up in drugs and that he was probably just going to die anyways. You cowards came in rough rugged and raw that night, as usual. Beat down or shoot first, ask questions later, that is how you operate in our barrios. Believe me, I know from personal experience. That is not how cops operate in the rich neighborhoods, best believe this would not happen if the Oxnard PD showed up to Oxnard Shores and some rich white kid was going through the same scenario. I guarantee that the cops would have not even laid a hand on that gabacho. They would have brought in a trained negotiator to attempt to calm things down and deescalate the situation. They would have had the paramedics assist that gabacho on the scene and ensured he made it to the hospital alive and received the highest quality of medical attention, and then rehabilitation programs. The Oxnard Police on that night, judged, convicted and took Robert’s life, squeezing the last breath out of him by beating him to a pulp. We hear that he might have even been handcuffed already and that Robert screamed for them to stop as the cops proceeded to take cheap shots at him, como cobardes. Robert was denied those privileges afforded to those that have power, the rich and their children. What we are talking about here tonight is that the very fabric this entire genocidal sistema we live under was woven and is soaked with blood of the indigenous peoples’ and the African slaves by a Culture of Violence that established the laws that govern us today and hire the police that now roam our streets. What we are talking about here tonight is privilege, racism, and economic/political/social oppression. What we mean by this is that, the police have the privilege of going back home, which is not here. They do not live amongst us; they live as far as they can from us. You better believe that cops would treat our community differently if they lived next door to us. We would know where they live if they even hinted at wanting to brutalize us. We are also talking about the privilege of not dealing with the impoverished conditions the majority of our community struggles with, working the lowest paying jobs, having the least in funding for education, community recreation programs, and employment opportunities for our youth. Over half of the City of Oxnard budget goes to the Oxnard Police, so that they can put more police on the street to brutalize us, and so that they can buy all of their weapons they use against us. We guarantee you, give us, the community, $10 million dollars per year and we will improve the conditions in our barrios. They won’t give us those resources though, it is controlled by the cops, this city has historically been a white-landowner and police run city and it still is! Usually to get elected around here, you have to kneel and kiss the ring of the cops, power-brokers and their lackeys. So, we are here tonight to say Ya Basta! We are tired of this systemic, state-sanction terror against our gente. We will at minimum demand for an independent investigation into the death of Robert at the hands of the police. We will demand and organize the formation of an independent Community-Based Police Review Board with the power to fire any cop that unjustly lays their hands or causes harm to our youth, men, or women. We will demand that the killer cops be removed off our streets. We will demand more resources for our communities for youth programs. Justice for Robert Ramirez and all of the victims of Police Terror in Raza and Oppressed Communities! Que Viva la Raza! This entry was posted in Análisis // Analysis, Brutalidad Policial // Police Brutality, Movilizar // Actions, VIDEO. Bookmark the permalink. Organize to Resist Police Brutality: Self-Defense is Our Duty and Our Right! First I wish to offer my condolences to the Ramirez family. My name is also Roberto Ramirez. I guess I am lucky to be here sharing my experiences. On Aug 9th at approx. 4:30 pm I was crossing the border with my wife in Tijuana when we were arrested at gunpoint and detained for 3 hours by the US border patrol for no other reason other than my name was on a “wanted” list or something to that effect. They had 4 or 5 border patrol goons with rifles and pistols drawn demand that I get out of the car and get on my knees. I thought that I was going to be executed right there. They handcuffed both my wife and me and treated us like criminals with the fingerprinting and pat downs ect. They let us go after they got a clue or something but they never even apologized. My poor wife was traumatized and cries even now when she recalls what happened. Believe me, we know who the real terrorists are! My condolences again to the Ramirez family. If my story sheds any light on the lunacy and injustice of law enforcement tactics, I dont mind sharing it.